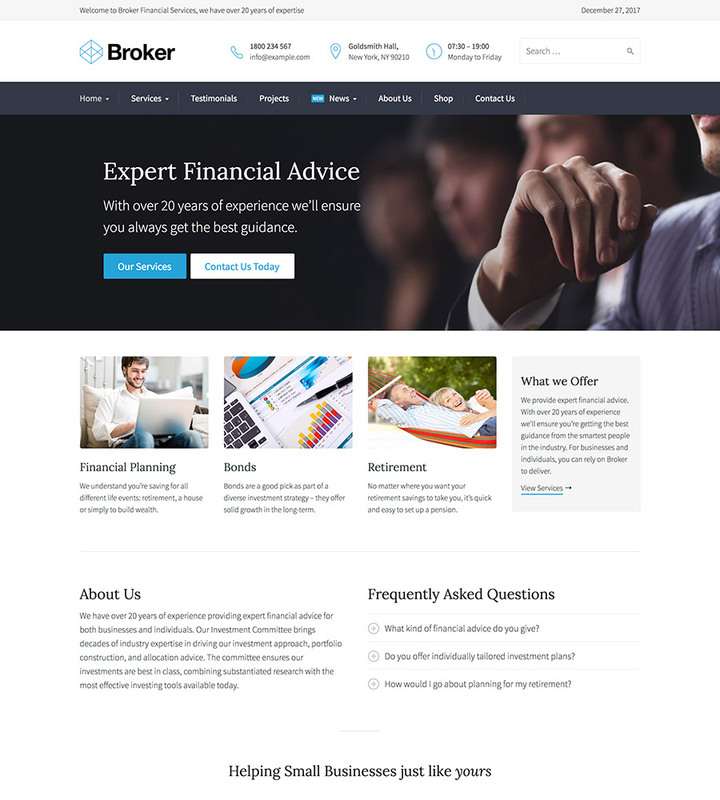 Broker is a top-selling, superbly designed WordPress theme for financial businesses with real demo data. Broker is our best selling WordPress theme of all time with over 2,000 sales. After studying the market for a clean, straightforward finance and business WordPress theme, we were not being happy with what was out there so we built Broker! The theme now has six gorgeous homepages which suit any firm within the corporate sector. Plus, it has world-class support and a perfect five-star rating on ThemeForest! It’s easy to quickly recreate a website similar to our demo site in minutes using the theme’s one-click installer. With Visual Composer and LayerSlider all the tools are at a customer’s disposal to build a great business site. Don’t waste hours reading manuals to get up and running so get a website built faster and start selling today. Page titles include a bold, clear call to action button so that you can draw readers attention to a particular part of the site. With customizable sidebar content and beautiful inside pages with real content, you’ll get a great head-start. Broker is fully compatible with the leading SEO plugin on the market, Yoast SEO and passes Google’s Structured Data Testing Test Tool. Plus, when you do need help we’re here for you. Our customers rave about our incredible response time. Broker includes integration with WooCommerce so it is extremely easy to include eCommerce functionality to your site. This powerful plugin can be used to sell any kind of product. Since it can be added at any time, it can be added when your business is ready to start selling.